Currently, most of our clients are in a rush – they are improving their email marketing toolkits and preparing for customer traffic during the season sales. One of the key features in this toolkit is an automated welcome email or welcome series (3 emails). It is sent to new subscribers immediately after they have signed up. This article concerns how to be hospitable to new subscribers, make them convert, and avoid them ignoring your welcome emails. Learn how to make them attractive and converting! 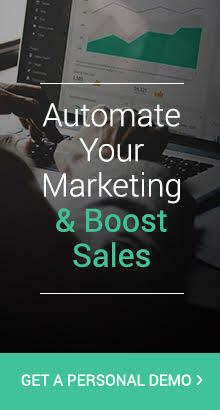 Before that, however, it’s important you’ve got a great strategy in place—read here for some great email marketing automation tips and strategies. First of all, do not forget that the same general email rules stand for all business emails. An incorrect sender’s name, subject line or other common mistakes have been described elsewhere. They should be taken into account. A welcome email and series of them, in comparison with other emails, is a little bit more special. According to recent Omnisend ecommerce email marketing research, the average revenue per promotional email is $0.10, welcome emails on average result in 6x higher revenue –– $0.61. 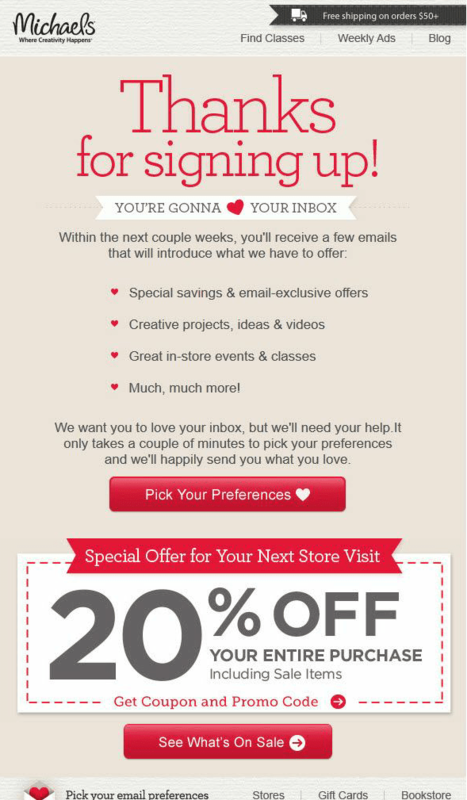 74.4 % of customers expect a welcome email when they subscribe. This means that the approach of new customers is more positive and engaged than ever. Don’t let them down – provide them with a top-notch welcome email. It’s always easier to absorb information when it is clearly structured. 1-2-3 steps are a good solution when you have more than one thing to say or want to encourage a newbie to take certain actions. A great example is the AirBnB welcome email. Please note that Call-To-Action button still has to be the one and only if you want it to be effective. A structured list could be used also as a way to encourage a subscriber to sign up for your newsletter. Make a list of the advantages of subscribing. Michaels does it right. 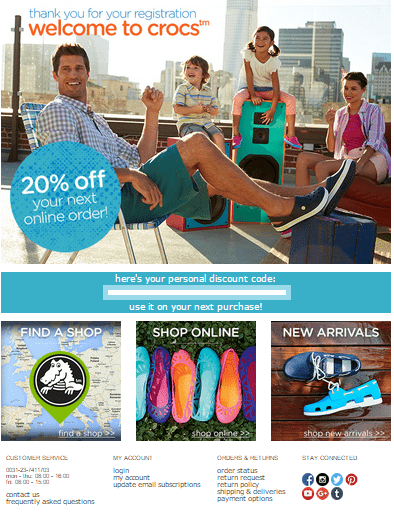 The tone of the email should fit the tone of your entire brand communication. Build friendly relationships and use casual words. It’s a natural thing – we enjoy communicating with positive, relaxed and friendly people more. A great example of a warm conversational tone is The Dancing Jewels welcome email. However, this welcome email could be improved by adding a logo to strengthen the brand identity or making the call-to-action button brighter. For more about call-to-action read below. 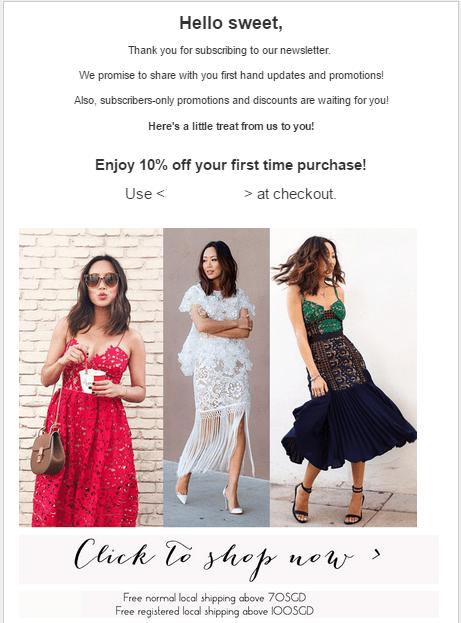 By offering a discount or some sort of a gift, you can create goodwill between your business and your new engaged subscribers. It often breaks the ice for the first purchase. 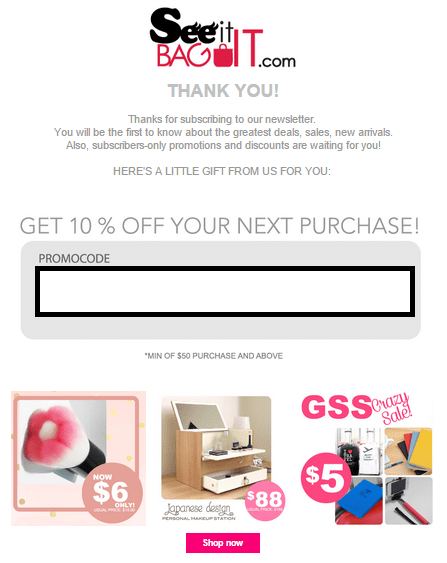 For example, the SeeItBagIt.com welcome email offers a discount code and has a clear C-T-A button. 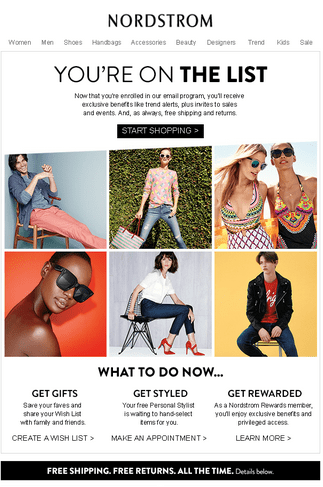 When you have an almost perfect welcome email design, it is time to look once again at the call-to-action (CTA) button. Does it clearly reflect what you expect your recipients to do? Is it bright and in a convenient click position? Do not place the call-to-action button at the very end of your email – it should be visible on the screen without the need to scroll. Make it short, simple and bright. Designing an effective CTA is an art, but you definitely can test various options and discover which ones work for you. Congratulations if you already have an idea for your new welcome emails. The content is crucial for your success. Nevertheless, the right timing and subject lines, as well as the rest of the campaign are important for achieving best results. Take care and good luck with making a top-notch first impression on your customers! Great to hear! Sign up to our newsletter, soon we will share the results of Soundest email marketing research.